This year for Mother’s day I decided to make my mother-in-law a cupcake bouquet (I would have made one for my mum too but she lives in Perth). My mother-in-law loves flowers so I thought I would make her an eatable bouquet. The cupcakes are mini red velvet cupcakes with pink cream cheese frosting. I frosted the cupcakes with a star tip to give it that rose effect. 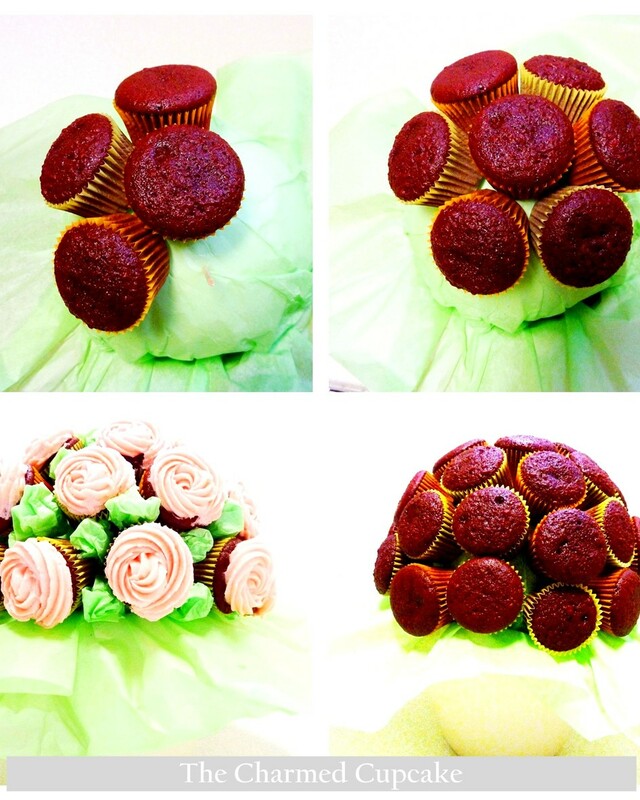 So I would like to share with you how I made this beautiful cupcake bouquet. To assemble the pot I lined the pot with a layer of wrapping tissue paper, next time I will use coloured cellophane as you get oil spots from the buttercream . 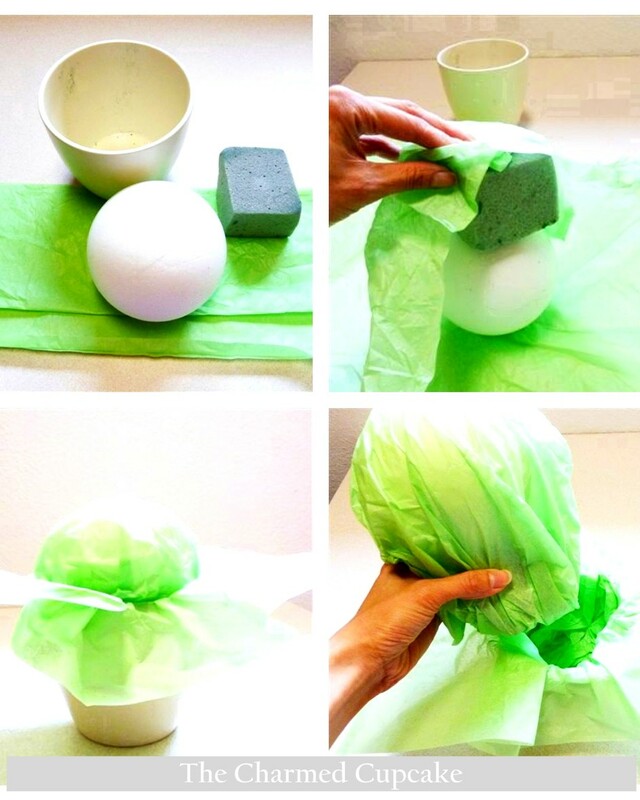 I then wrapped the florist foam and the ball together with another layer of wrapping tissue paper so that the ball stayed in place and wouldn’t topple out. You wouldn’t want all that beautiful hard work gone in a topple! Also the wrapping tissue paper covers up the foam. At this stage it looks like a cabbage head. Now I like to start at the top and work my way around the centered cupcake but some people like to start from the bottom – it’s all personal preference. Put in the first toothpick and then the cupcake. Keep doing this process by working your way around making sure the cupcakes are positioned close and tight together. Once they are all in position you can start frosting. Of course you can also frost the cupcakes first and then assemble, I prefer to frost after they are assembled as it’s easier to adjust the cupcakes if they need to be readjusted without messing up the frosting. I didn’t have time to make fondant leaves so I scrunched up some of the green wrapping tissue paper and stuffed them in the gaps to make it look like leaves. 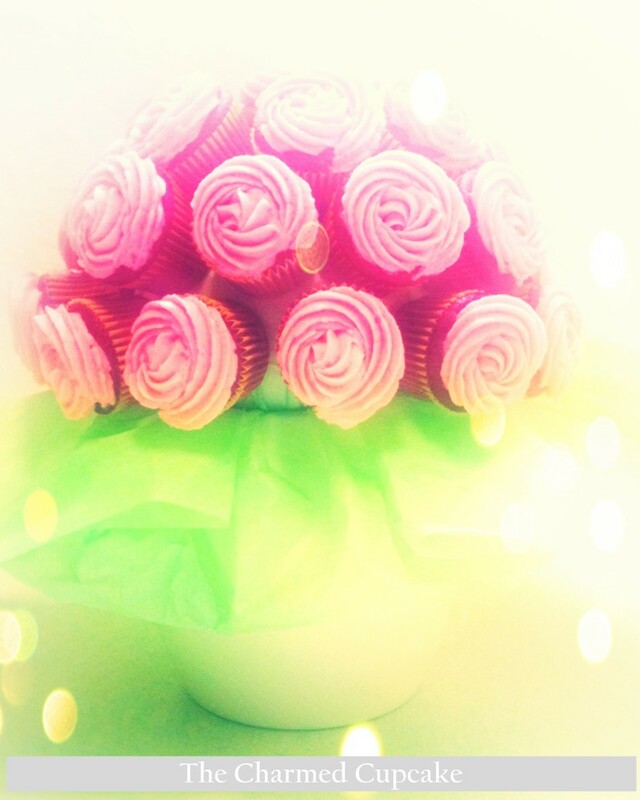 So there you go, a rose cupcake bouquet. This is my fourth attempt at making this so I am always learning new tricks each time I make it. If you give it a go have fun making it and let me know what you think. Feel free to share any tips you might have. Thanks Caity but anyone can make it 😉 you should give it a try. 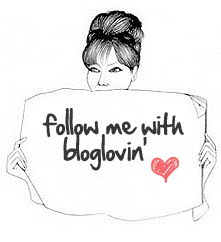 Such a cute idea, LOVE IT! !